Calle’s intervention at the Freud Museum injects an aggressive feminine touch into the master’s masculine preserve. Sophie Calle described one of her projects thus: “In his novel, Leviathan, Paul Auster thanks me for having authorised him to mingle fact with fiction. And indeed, on pages 58 to 68 of his book, he uses a number of episodes from my life to create a fictive character named Maria, who then leaves me to live out her own story. 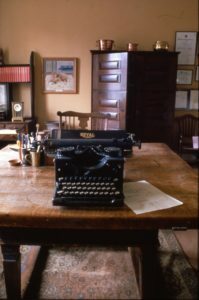 Intrigued by this double, I decided to turn Paul Auster’s novel into a game and to make my own particular mixture of reality and fiction.” In February Calle’s extraordinary blend of reality and fiction transformed the Freud Museum with texts and objects woven into a narrative of drama, fantasy and wit. The exhibition was suggested and curated by James Putnam, and we were delighted that Jenni Lomax, director of the Camden Arts Centre was happy for this show to run alongside their exhibition Double Game. The press and public interest in this show produced 240 visitors in a single day, the highest number in one day since the Museum opened.